The Tibetans have a concept called a tulpa. It’s a sort of thoughtform. The idea is, if enough people believe in something hard enough, it becomes a truth. Becomes real. Now, I don’t have a lot of research to back this up, because that seems like it would require a lot of work, but I’m pretty sure that’s how all of this stuff happens. Belief is a powerful thing, and what’s a religion or a folktale but a whole crapload of people believing in the same ideas? Whether it’s a thunder god or a brain-eating zombie or the Jersey Devil, it all stems from belief. Problem is, most of the stuff we believe in these days was already pretty firmly established hundreds if not thousands of years ago, so it’s hard to see it in action. Hard, but not impossible. You’re listening to Chemirocha. Ethnomusicologist Hugh Tracey recorded this song in the 1950s while living with the Kipsigi people, a tribal society in Kenya’s Rift Valley. The song, sung by a group of Kipsigi girls backed by a traditional kibugandet, is about a folkloric creature called, go figure, the Chemirocha. Sort of a Sub-Saharan Pan-type character. Half-man, half-antelope, the Chemirocha plays a role in the Kipsigi fertility rituals. This song is a call to the Chemirocha, entreating him to be happy and dance until his clothes fall off. Oh man, we’ve all been there! What’s especially notable about the song though, is the music. It’s kind of familiar, right? There’s sort of a twangy, early 20th century, hillbilly music vibe to it that seems out of place in an African fertility song, but it’s not as out of place as you might think. That is Mule Skinner Blues, recorded by American country music performer Jimmie Rogers in 1930. Hang on a sec…Jimmie Rogers? Chemirocha? See where I’m going here? Turns out Jimmie Rogers was fairly popular with the Christian missionaries back in the day, and at least one of them hauled a gramophone and a selection of 78s on their trip into the Rift Valley. The Kipsigis heard this warbling, unintelligible ululation and decided there was no way that strange voice was coming from some ordinary man. This “Chemi Rocha” was something else. Something magical. It took less than twenty years for country singer Jimmie Rogers to become pantsless dancing antelope-man Chemirocha. Oh, yeah. He’s extremely real! Like I said, it’s all about belief. You get enough Kipsigis singing songs like this, believing in the story, and before you know it you’ve got a tulpa on your hands. In this case, a living, breathing, beastman dancing himself right out of his trousers. You want something more recent? How about Slender Man? The tall, faceless nightmare with the keen fashion sense and the tentacular arms. This guy’s so new we actually know who made him up—a fella by the name of Eric Knudsen. Back in 2009 Knudsen photoshopped his Slender Man character into a couple of old-timey photographs and posted them to the SomethingAwful.com forums, expecting nothing more than a couple of “good job”s and a handful of graphic descriptions of his mother’s sexual proclivities. What he got was something else entirely. Something about the Slender Man caught the Internet’s imagination. It tickled that Fear of a Faceless Stranger archetype that we’ve got hardwired somewhere deep in our lizard brains. Slender Man went viral. Others created their own Slender Man images. Expanded his mythology with their own stories. Plastered his image on t-shirts and posters and video games. 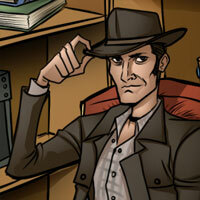 Cosplayed as him. And somewhere along the way, people started to really believe. It didn’t matter that Knudsen clearly made him up, the belief was too strong. People feared him. At least one even tried to kill for him. Slender Man was becoming real. I’m not gonna say that I’m one of the True Believers, but you won’t catch me hiking through the woods at night either. 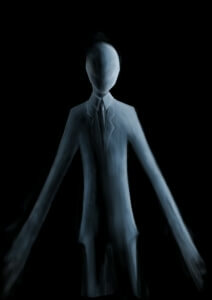 Slender Man might be the first true folkloric creature of the 21st century, but I guarantee he’s far from the last. The Internet is a huge community, and their belief is powerful. Alright. You watched your videos. Class dismissed. If you need me, I’ll be slumped over my desk wearing sunglasses indoors. Try to keep it down on your way out of the classroom. If you could all start believing real hard in an instant hangover cure, Kentucky would appreciate the hell out of it. Just try to do it quietly.